That’s right, it’s trivia time! Where are your smarty pants and your thinking cap?? You don’t want to leave home without them! 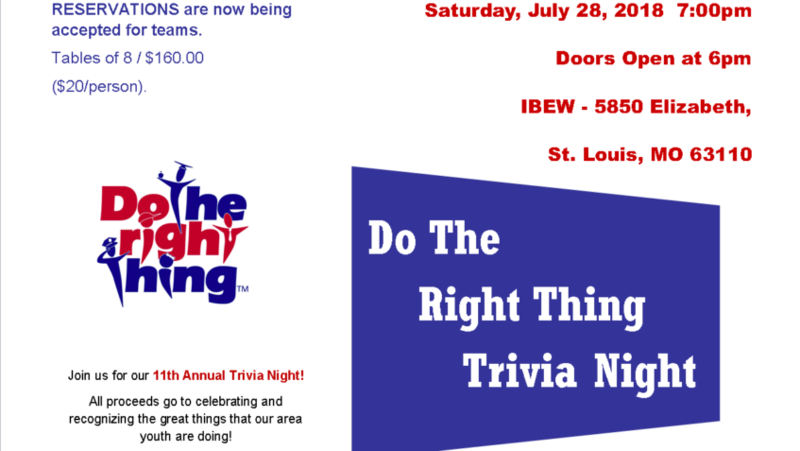 Join us for our Eleventh Annual Trivia Night on Saturday July, 28, 2018 at 7pm (doors open at 6) at the International Brotherhood of Electrical Workers Hall at 5850 Elizabeth, St. Louis, MO 63110 (near Hampton). To register send an email to dtrt@slmpd.org or give Tracy a call at 314-444-5328 and reserve your table of 8! Tables cost $160 ($20/person) and include soft drinks, beer and snacks; you are welcome to bring your own bites and beverages as well! Mulligans, 50/50, raffles and auction items will be available for additional purchase and you know we bring out some awesome stuff!! 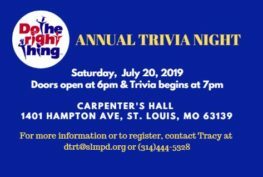 12th ANNUAL TRIVIA NIGHT for Do The Right Thing!